Happy Reading and Happy Creating! I wholeheartedly agree with the above quote by E.B. White. Each of us should have a chance to win the big prize, shouldn’t we? 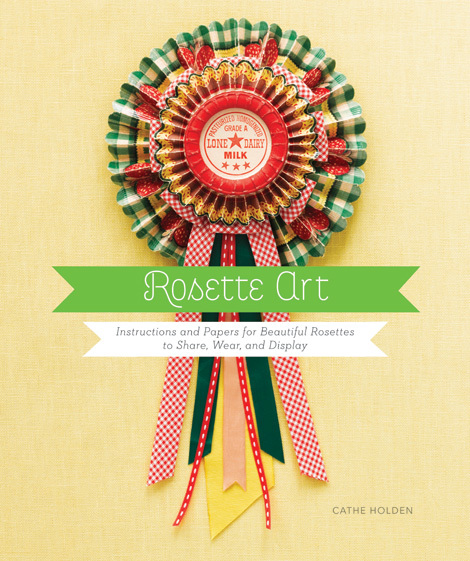 Well, there’s no better way to give a fantastic “prize” to someone you love than to make something from Cathe Holden’s recent book, Rosette Art (Chronicle Books). 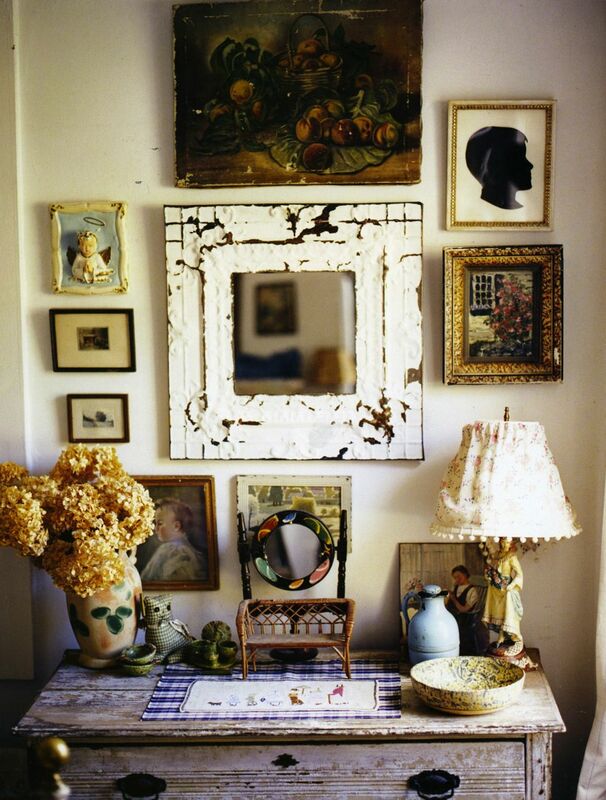 We’ve all got them… stashes, boxes, bags and drawers overflowing with simple treasures we can’t bear to part with. Vintage fabric, ribbon and buttons; lovely papers, pretty pictures and tiny trinkets. 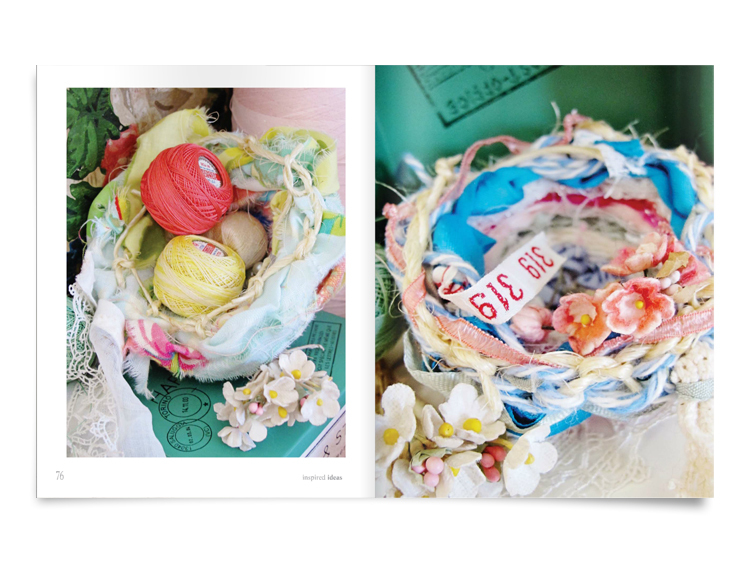 Well, Cathe Holden presents the perfect project for using up some of our beloved scraps…. Rosettes! Such a simple, but versatile idea! This one-of-a-kind book is more than an assortment of unique rosette crafts; it’s also a collection of lovely papers to incorporate into the designs. 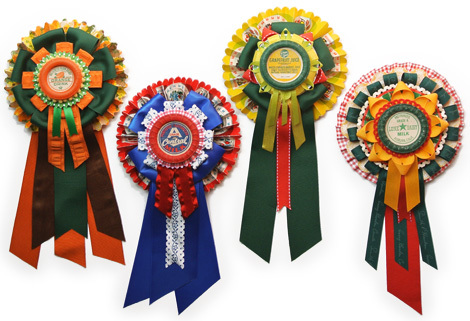 For many, the traditional rosette reminds us of the elusive first-place ribbon. However, with inspiration from this book, you can make a loved-one, or even yourself, feel like the grand-prize winner! The endless list of suggestions will start your own creative juices flowing, and soon you will be hooked-on dreaming up your own clever rosette patterns. Try a garland, mobile, ornament or wreath. Whatever you choose, you likely won’t be able to stop with just one! 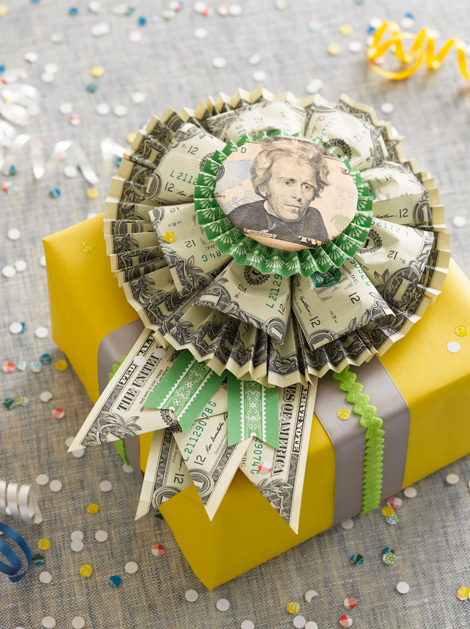 Head on over to Cathe’s website, Just Something I Made to get started on one of my favorite projects from the book — the Money Rosette. Wouldn’t this be a perfect “prize” for someone’s special birthday? She also shares the directions to make these amazing shelf-paper rosettes. Can’t you just imagine all of the possibilities?! Pick up a copy of Cathe’s amazing book– complete with papers to get started. You’re sure to win first place with all of your friends when you whip-up some unique, and thoughtful, gifts! A foster child for all of her life, eighteen-year-old Victoria is emancipated from the system with few social skills and a bad attitude. Now all on her own, Victoria can’t help thinking about Elizabeth, the loving woman who once wanted to adopt her – who took her in and taught her the beautiful language of flowers. After a heartbreaking chain of events separates them, Victoria copes by focusing on flowers, and using them to communicate her pain, until a chance encounter brings her face-to-face with her past – challenging her to move forward as she bitterly clings to the past. This beautifully written novel leaves the reader haunted by Victoria’s choices, but hopeful for the second chance she deserves. After taking this journey with her, you won’t look at a yellow rose or a cherry blossom in the same way, and you’ll find yourself thinking about the characters, again and again, wishing them well as if they were old friends. Check out the website for this lovely book and learn more about the author here. Happy Reading! 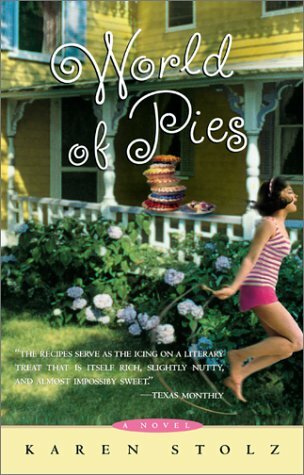 My book club read this lovely title a couple of years ago, and it still stands out as one of my all-time favorite “foodie” novels. Today I learned that the author has recently published its sequel, and it reminded me of how much I enjoyed it, so I thought I would share a little bit about it with you. I hope you’ll grab yourself a copy and when your done, please send me a note and share your thoughts. Happy Reading! As a young girl, Lillian learned that by combining certain ingredients in the kitchen she could make a connection with her wounded and withdrawn mother. As an adult, Lillian uses this gift to run a first-class restaurant as well as a weekly cooking class. On Monday evenings, students are allowed to conquer their fears in the kitchen as well as create delicious, simple food. 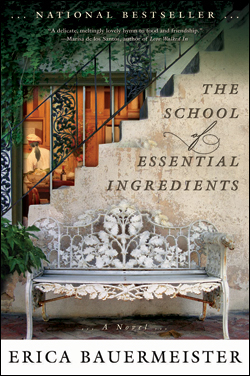 In doing so, each of them discovers what “essential ingredients” will not only improve their culinary skills, but also bring flavor to their lives. Told in a series of vignettes, readers will step into the personal struggles of each character and delight in the way stirring, slicing, smelling and tasting can inspire friendship and renewal. This tender novel will seduce your senses and inspire you to create loving menus with enticing ingredients. More importantly, through its tender glimpses into challenges of each character, it will encourage you to embrace your own abundance of small pleasures. With captivating language and believable characters, this insightful novel will leave you as satisfied as a delicious meal. Take a regular item, make it smaller, and what do you get? Something that’s just plain adorable! 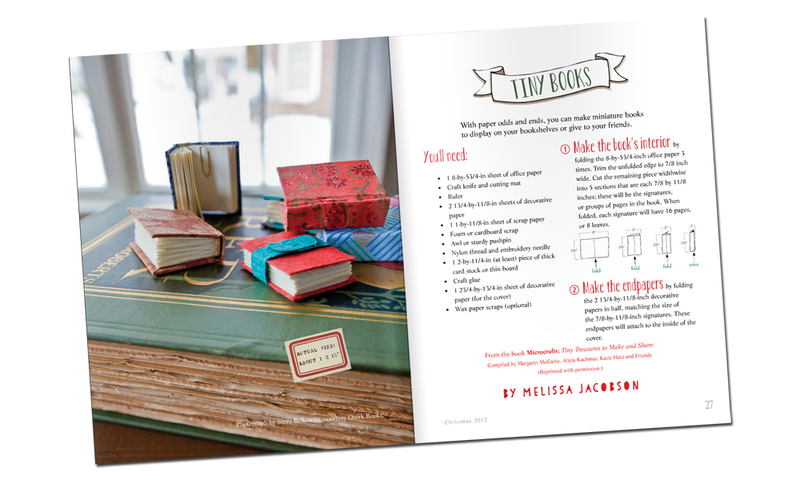 Miniatures have always been popular for their “cute-factor” and this book is BIG on cute. Prepare yourself for the dilemma of deciding which of the twenty-five unique and completely different projects you will want to make first. Will it be the scrumptious looking candy charms, the adorable little spool dolls, or perhaps the itty-bitty houseplants and terrariums? Whatever you choose to make, you will have something to decorate your dollhouse, give as a gift, wear as jewelry, or simply add some charm to a darling little shelf. Each project comes with simple, easy-to-follow directions as well as diagrams and illustrations that will make craft-time a joy. 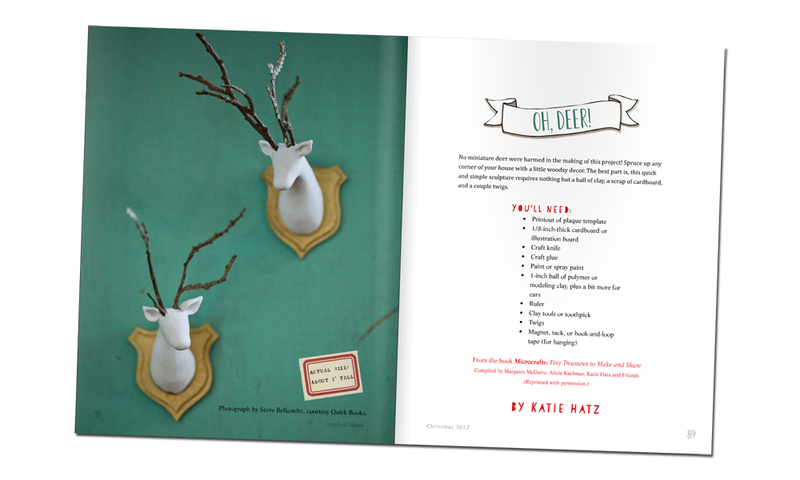 The photographs are lovely, and the overall feel of the book a blend of sophisticated whimsy. 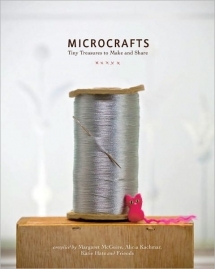 You will want your own copy of Microcrafts to turn to again-and-again– if for nothing more than to get your daily-dose of cute! We want to extend a big thank you to Quirk Books for sharing the “Book” and “Deer Head” projects from Microcrafts with us for this issue. Go ahead, give them a try, and don’t be surprised if you start dreaming up your own microcraft ideas! 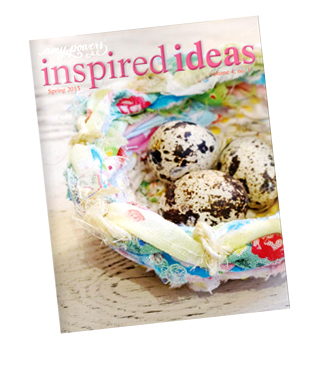 “Inspired Ideas” Spring Issue – It’s Here! I loved working on the spring issue of Amy Powers’ Inspired Ideas. Once again, I helped edit the articles and wrote several book reviews. 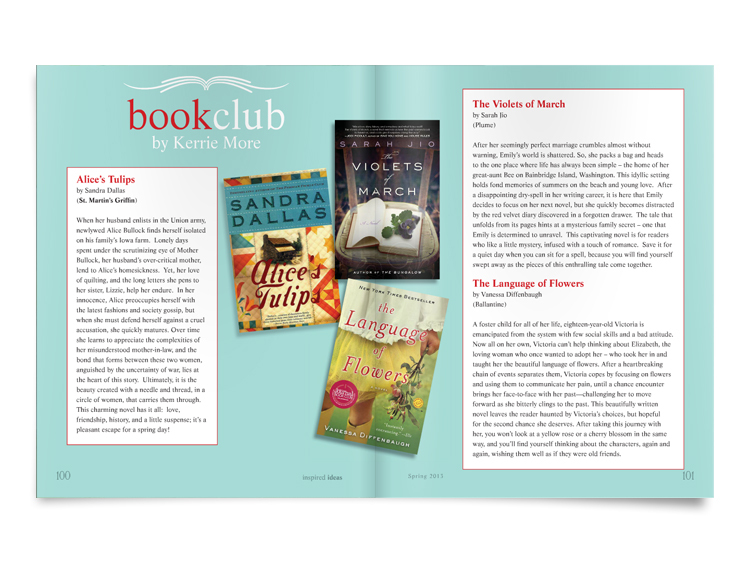 This issue includes several more book reviews for craft titles as well as three amazing fiction titles. This time I chose three novels with a flower “theme.” All of them are very different, but very good! 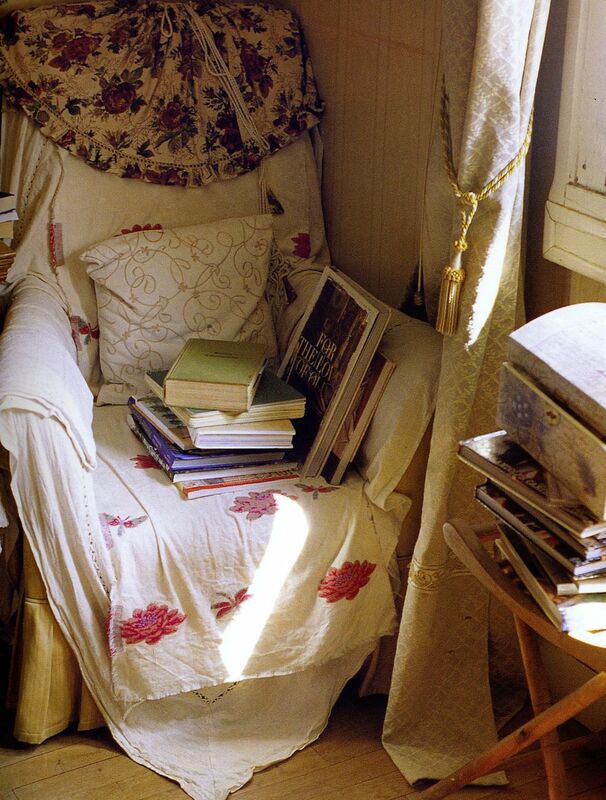 Isn’t this the perfect time of year to settle in a sunny window and crack open a good book? 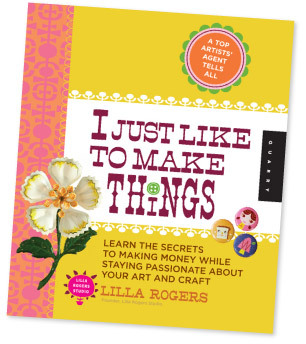 My favorite non-fiction book review this go-around was a fantastic little book by Lilla Rogers called I Just Like to Make Things. This book is just a treasure-trove of advice and inspiration for those of us who want to maximize our creativity. It’s especially for those who want to turn their creative passion into a career. Pick up a copy soon. You won’t be disappointed! However, it’s really the crafts that make Amy’s publication so special. Each unique craft idea is full of cheer and whimsy. You’ll have a hard time deciding which project to try first! 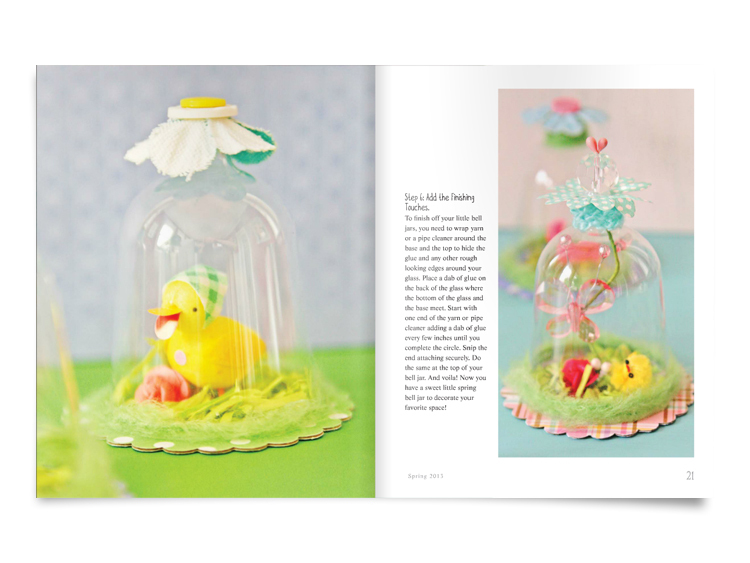 To be honest, Amy’s bird nests are at the top of my list, as well as the sweet little Easter cloches designed by Ashlee Park. If you’re in the mood to bust some of the stashes in your craft closet, head on over and check out all of the great ideas in this issue. It’s quite an amazing deal for so much loveliness! Be sure to stop back by and let me know if you read one of the recommended books or whip up something special for spring! Happy crafting and happy reading! If you’re looking for a great book to start off the year, here’s your next check-out or download! 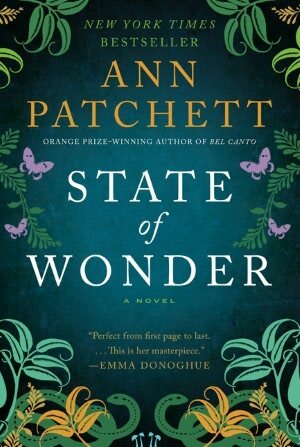 I recently finished this gem of a novel that incorporates history, love, mystery and a whopping twist at the end to keep you turning the pages. 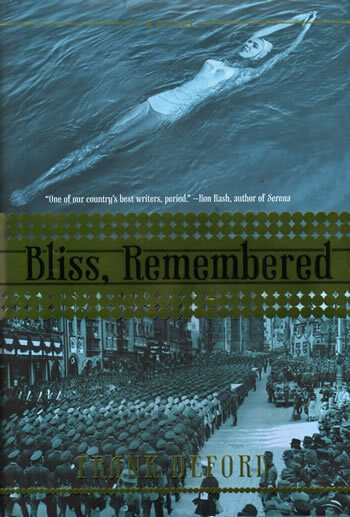 As Sydney reaches the end of her long, eventful life, she chooses to tell her son, Teddy, the secret of her trip to Berlin to swim in the Olympics. 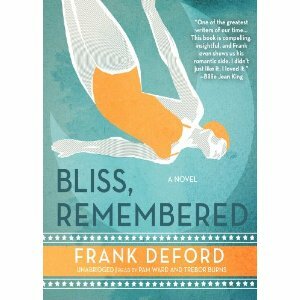 Almost by accident, she discovers the incredible talent she possesses for swimming as a sixteen year old girl mourning the death of her beloved father. As she follows her bliss, she finds herself crossing the ocean and wrapped-up in a whirlwind romance with a handsome German. This is a turbulent time in world history, and the implications of this love affair shape the rest of her life…as well as history. I know you will love this book as much as I did. It’s a perfect book to while away a long January afternoon. Don’t forget your blanket and tea! This E.M. Forster quote is fitting to accompany my review of the novel World of Pies by Karen Stolz, for each of these elements…. birth, food, sleep, love and death, plays a role in the life of the main character, Roxanne Milner. This novel is a quick read that takes the reader on a journey to Annette, Texas, and spans the turmoil of racial tensions in the 1960′s to the scars of those returning from the Vietnam war. Although larger social issues are present, the real story is the very normal journey from childhood to adolescence, and eventually adulthood, experienced by Roxanne. Each chapter paints a picture of an important period of time in the life of the extremely likeable main character. 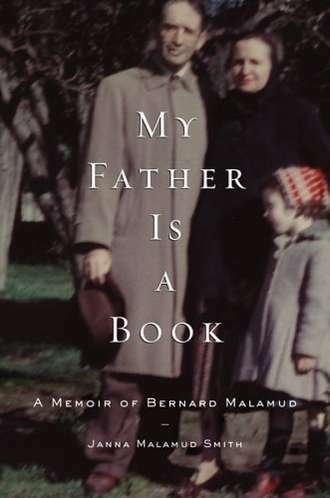 The reader is granted a glimpse into the small moments that formed Roxanne into a caring, sentimental, and supportive wife and mother. From her first experience with racism at the town’s first pie-baking contest, Roxanne learned from her mother the importance of holding true to one’s convictions. When she gets to meet her mother’s first high-school boyfriend, she sees her mother as a person with a story that is more complex than she ever imagined. When her beloved cousin returns from Vietnam injured and addicted, she learns the importance of family and how time can heal wounds. These experience, and many more, are framed by the Milner family’s love of food, and each chapter is concluded with a down-home recipe–one of which is sure to inspire the reader to roll up her sleeves! Doreen’s Frozen Fruit Salad is sure to evoke nostalgia and making it will surely connect you to the daily ritual enjoyed by Roxanne and her father at the local lunch-counter…swivel-stools and all! I’m sure if you indulge in Christina’s Lemon Meringue Pie, each bite will thrill you with tangy sweetness and remind you of her courage and conviction in a time when the color of one’s skin seemed to prompt exclusion. We’re all familiar with the power of food to heal, and Aunt Ruthie’s Lemon Pound Cake did just that when Roxanne’s mother had surgery, and she was faced with the reality of her mother’s mortality. If you’re in the mood for a coming-of-age story that will make you laugh and cry…this is it! The recipes are a bonus! Happy reading! Have you ever read a book, and thought that perhaps it was written specifically for you? 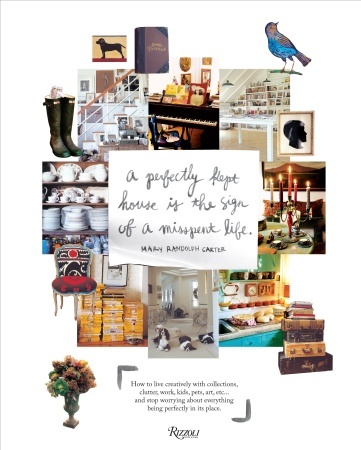 This lovely book is likely to strike a chord with many of us who live with: collections, memories, children, pets, clutter, work and lots of creativity. Mary Randolph Carter, author of several books dedicated to “junk,” has written a book that provides much-needed affirmation for those of us who experience a love-hate relationship with our houses. We hate the burden of keeping them clean and tidy all of the time, but we love to bring lovely things into them, and fill them with the items that speak to us and bring us joy. Somehow these two desires create a conflict. Carter’s solution? Give up the idea that our houses have to be perfect, and simply live in them in a way that brings comfort and joy not only to you, but perhaps more surprisingly, your guests as well! Seriously, think about the houses you enjoy visiting. Are they the stark homes in which you feel nervous to set foot inside? The homes where not a picture frame or throw pillow is out of place? 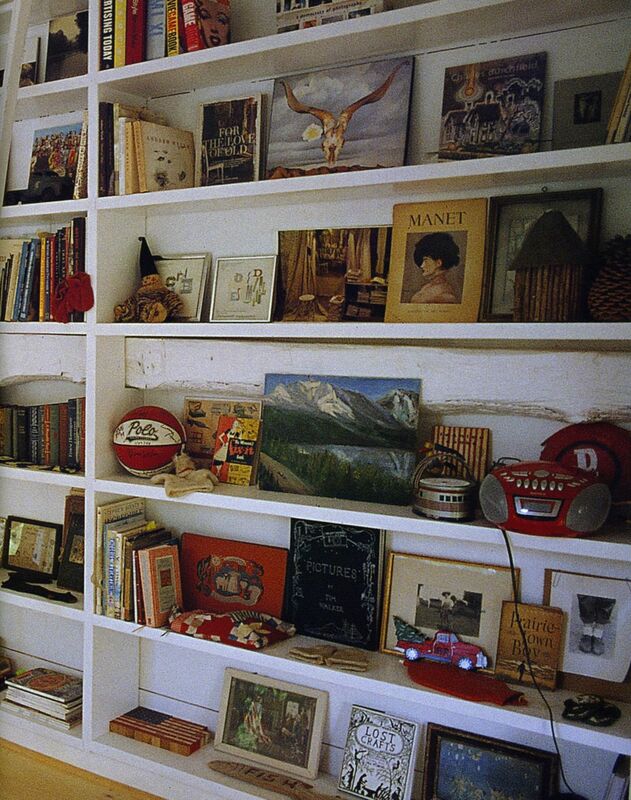 If you’re like me, you much prefer your friend’s house where you can admire the refrigerator filled with family pictures, paw through the stack of books on the ottoman, tuck your feet under you in a cushy chair, and delight in the creative vignette of collected whimsical items on the mantel. A little dust? Who cares. A friendly dog giving you a friendly greeting? All the better! 1. There really are other people out there who have a compulsion to bring something home from the side of the road or from a junk shop. They don’t NEED this item, they just love it for some unexplainable reason, and it makes them happy to look at it. 2. For many beauty lies in the imperfect and the informal. 5. On page 131, Carter shares her practice of keeping a personal welcome book… a place for friends to jot down their memories of visiting your home. This idea stuck with me and it is my intention to purchase a simple blank book and some colored pens to encourage my guests to chronicle their time at our cabin in the mountains. Isn’t that a fun, simple idea? 6. There’s a fine-line between living with our treasures and being on the next episode of Hoarders. Be mindful that you don’t cross the line! Aside: On more than one occasion, I have mentioned my favorite magazine Where Women Create created by Jo Packham – which is a quarterly gallery showcasing the creative spaces of a diverse group of artists. 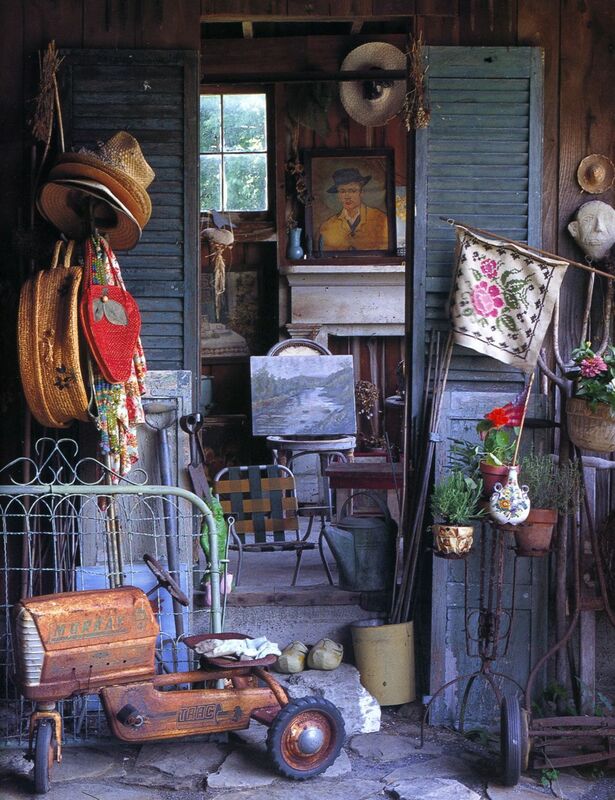 If you are a fan of this publication, you will know what I mean when I say you want to slow down and savor each picture, admiring each lovely item in these creative spaces. I felt the same way about Carter’s book. On more than one occasion, I would put the book right up close to my nose to try to figure out what lovely item was tucked on the corner of a shelf or under a table. That’s how I enjoy each lovely issue of “Where Women Create”! Recently I had the pleasure of reviewing an incredibly beautiful and absolutely inspiring book…. 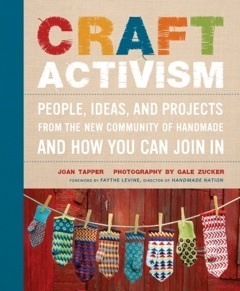 Craft Activism by Joan Tapper and Gale Zucker. This amazing book was selected in Amazon’s Best Books of 2011! (You can check out my more complete review here.) After posting my review, I was delighted to hear from Joan, herself, and was not surprised to learn that as a writer, she is also an avid reader. I thoroughly enjoyed her book, but I especially enjoy stopping by her blog from time to time to see some of the amazing projects that have been inspired by her book. (Seriously, it looks like she has the most interesting life!) I know you will enjoy some of these fantastic creations as much as I do! 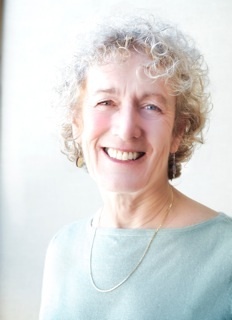 Among other topics, Joan has written about creativity, travel, and interesting places, and is a sought-after editor who lends her skills to a wide variety of genres. Check out her website to learn more about this talented writer. What creativity do you share with the world? I believe in the written word, and as a writer and editor have tried to promote excellence. What is the next book on your stack of books to read? I’ve got Ann Patchett’s State of Wonder and Eleanor Brown’s The Weird Sisters (both passed along by a friend), Janna Malamud Smith’s My Father is a Book and Cynthia Ozick’s Dictation (courtesy of a book giveaway at the community college where my husband teaches) and Katherine Stewart’s The Good News Club, written by a friend and bought at a book-signing event. How do you acquire the books you read? I’ll reserve a book at the library when I read a promising review; that extends to popular mysteries and thrillers and literary novels. I’ll pick up a book at Chaucer’s, my local indy bookstore, for an upcoming book group meeting. Occasionally a friend will pass along a book. Online? On rare occasions. How do you choose the books you read? I follow certain authors, but I’m interested in many subjects, both fiction and non. When I read a review that sounds interesting, I’ll make a point to find and read it. But I also am delighted when members of my book group choose something I would never have thought of…a classic, science fiction, a science topic. I like being introduced to new writers and ideas. Do you have a book that you love so much that you re-read it periodically? You can put me in the Jane Austen club. 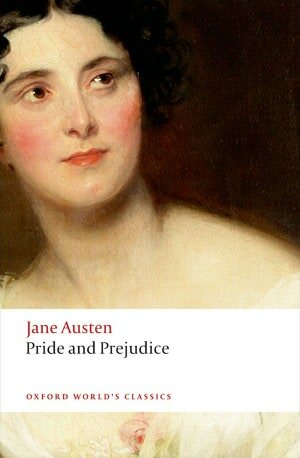 I could read and reread Pride and Prejudice or Persuasion every year. 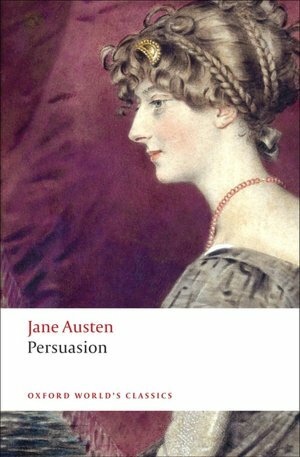 Austen is sharp-eyed and precise in her use of language. And of course, you always know things will turn out well for the heroine. What a comfort! What are the characteristics of your favorite books? I think I tend to like books whose authors exhibit a wry sense of humor and a generosity toward their characters, as well as an acute sense of place. That could mean Ann Taylor’s works, those by Alexander McCall Smith, Larry Shames’s Key West mysteries; it could mean Tolstoy’s War and Peace or Anna Karenina. 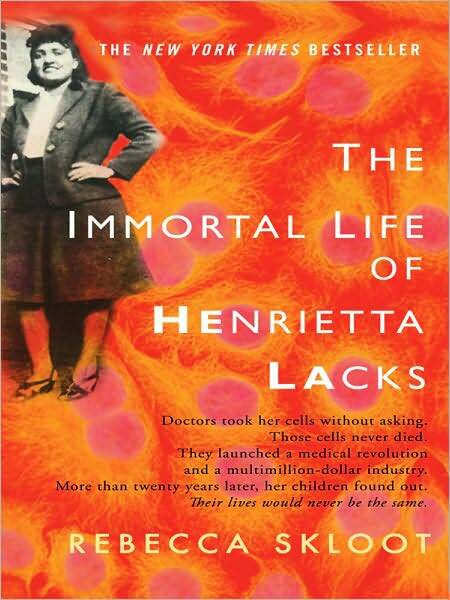 Even a nonfiction work like Rebecca Skloot’s The Immortal Life of Henrietta Lacks shares those qualities. How do you fit reading into your busy life? It’s not an issue. If reading is important – and it is – you find time to sit down for a few minutes and do it. I’ll start with newspapers at the breakfast table, a magazine story over lunch, and a book for at least a few minutes (and often more) at bedtime. 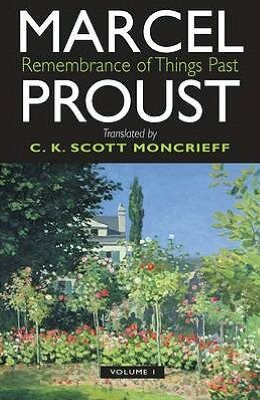 I am proud to say that I have actually read… Proust’s Remembrance of Things Past and Anthony Powell’s A Dance to the Music of Time – both brilliant multivolume sagas. I took them on lengthy vacations many years ago and they filled the hours wonderfully. I am in a book club and it goes something like this…. There are about 13 of us and we meet each month (first Wednesday) at a different house, which goes in alphabetical order. Hostess provides dinner (often memorably keyed to the book.) We eat and discuss. Everyone gets to have a say uninterrupted, then it’s a lively free for all. It’s a fairly literary group, with several writers and a publisher included, so opinions are strong. Then the hostess gets to choose the book for two months down the road, which gives us time to get it from the library and actually read it. 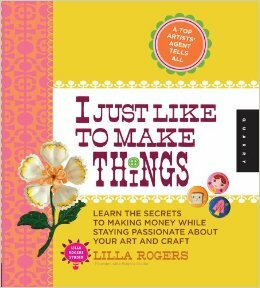 One of my favorite craft books is…. 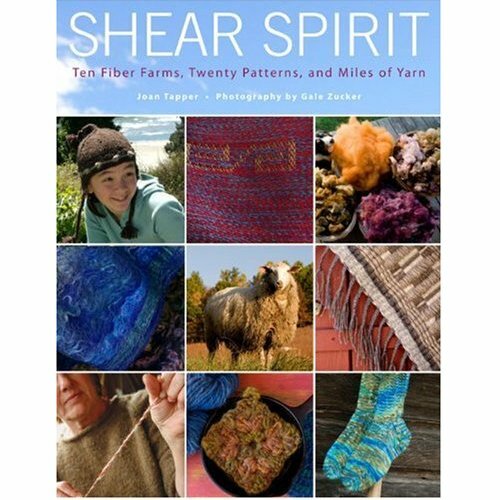 My own two, of course, with photographer Gale Zucker: Shear Spirit and Craft Activism. Thank you, Joan, for sharing your love of reading with us! Here’s to good books, good writing, and new friends!